the gates” of the burnt cities to plunder and “seize the wealth” that was left behind. along with eight descriptive words to identify what kind of “Day” it was for Judah that Edom took advantage. These were the days of Judah's misfortune, destruction, trouble, disaster and calamity. Edom demonstrated a hostile attitude that manifested in physical violence against God's people. Obadiah tells Edom their days are numbered because of this behavior. from history never to rise again. In the 46th Psalm of the original King James, which was printed in1611 AD, William Shakespeare’s 46th year, the 46th word from the beginning is “shake” and the 46th word from the end is “spear.” Seems like the language scholars wanted to impress one of their contemporary celebrities with their translation work! Apologia (Gr) - Defense (Eng) – the Greek word apologia means “to defend” or “to make a defense.” It was used in the Greek language to refer to the argument for the defense in court during a judicial interrogation. The word apologia also refers to an informal explanation or defense of one’s position concerning politics or religion. Peter uses to describe the answer given to the skeptical, abusive inquires of anti-christian citizens. Mordecai, Esther’s cousin, sat in the gate in Susa (Esther 2:21). This gate has been excavated. Could I give a defense for the Truth of Scripture in a court room? to a friend? Does my life reflect the life, resurrection and character of the Lord? I will prepare myself to defend the Truth of scripture and demonstrate the life of Jesus in me. "It is not good to punish an innocent man, or to flog officials for their integrity." 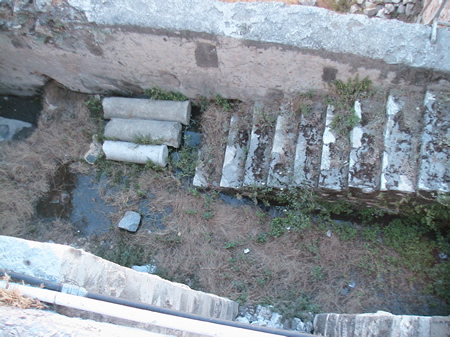 Pool of Bethesda - It was not until 1888 that a group of archeologist uncoverd this pool. Critics of the authenticity of the Bible had doubted the existence of this site. Some had attributed the 5 colonnades mentioned by John to be symbolic of the first 5 books of the Bible. In 1888 K. Schick found twin pools here: one 55 feet, a second 65 feet long. The five covered colonnades mentioned by John were also discovered. Lintel over the Double Gate that led from the south side up to the surface of the Temple Mount in Jesus' day. 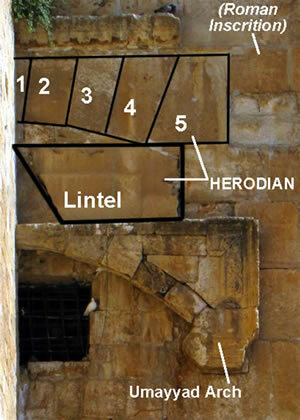 Notice the four trapezoidal stones forming the arch of the Double Gate from the days of Herod, and the large horizontal lintel directly below them with the wide margin and boss also part of the original gate lintel from the 19 BC-70 AD.